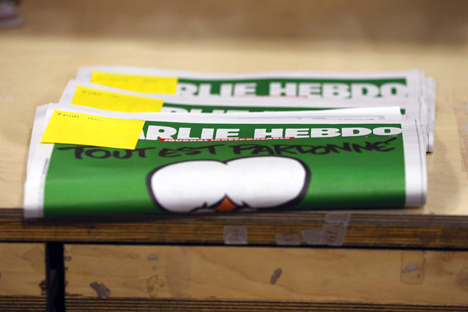 Unlike their Western counterparts, many Russians do not see the new Charlie Hebdo cartoon as a defiant expression of free speech. The passion that swept France and other countries in response to the Jan. 7 shooting at the headquarters of satirical magazine Charlie Hebdo in Paris has spread east, although the reaction among Russians is significantly different from that in the West. In Moscow, the latest cover of the magazine, featuring a new cartoon of the Prophet Mohammed provoked a fight at the city’s largest mosque while in Russia’s predominantly Muslim region of Chechnya, a protest was held in response to the cartoon. The Jan. 14 incident at Moscow’s largest Muslim place of worship – the Cathedral Mosque – attracted the attention of many Russian media outlets. Citing the Council of Muftis of Russia, the Kommersant daily reported that a group of 10-15 Central Asian immigrants attempted to break into the mosque to use its microphone to call on worshipers to go to the French Embassy and protest the new cartoon of the Prophet Mohammed. However, they were prevented from doing so, and they started a brawl on their way out, beating up a man attending the mosque. The Council of Muftis said they will ask the police to open a criminal investigation into the beating. At the same time, the Council condemned the new cartoon as an inappropriate response to the extremists who perpetrated the shooting and said it offends believers. The Council urged Russia’s Muslims not to yield to provocations. Moscow city authorities have rejected an application to hold a rally against insulting the feelings of religious believers on Jan. 25. Russia’s Muslims are not the only demographic to criticize Charlie Hebdo’s new cartoon of the Prophet Mohammed. Russian officials have urged media outlets not to reproduce the drawing. A regional subdivision of Roskomnadzor, which supervises the Russian media, warned journalists not to publish any cartoons of religious leaders, and the agency later confirmed that it had undertaken “preventive measures” with regional media outlets by reminding them of the importance of obeying the law that prohibits incitement to sectarian strife. Can Russia's experience with Islam be useful to EU? According to sociologists, Russians generally do not support the publication of scandalous drawings. Leonid Sedov, a sociologist who worked at the independent Levada Center polling agency said that the vast majority of Russians respond harshly when any “sacred precepts or ideologically fundamental stereotypes” are addressed. According to Sedov, even though Russians are not so zealous about religion in their daily lives, they have an extremely negative perception of attacks on “sacred and spiritual things.” The “ideological consciousness” of Russians has a role to play in this, the sociologist said. Unlike in Western countries, in Russia this type of cartoon is not considered an expression of freedom of speech, he said. Prominent Russian journalist Vladimir Pozner, a dual French-Russian citizen who also worked in the U.S. told the Dialog news agency that the new Charlie Hebdo cover shows that the French will not be frightened by terrorists. "It doesn't seem to me that it is the answer. Rather it is similar to the policy of the magazine and the point of view of the situation from those people who own it. They seem to say ‘you won't frighten us.’ I can't say that I share their point of view, but they probably have it right," Posner said. According to him, it is quite possible that new issue of the weekly will cause another round of attacks. The cover of the new Charlie Hebdo features a caricature of the prophet Muhammad with the inscription "Everything is forgiven." The issue appeared on Jan 14.